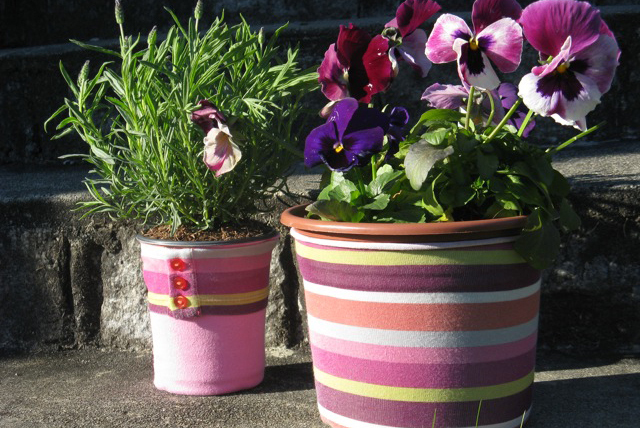 Give ugly plastic garden pots a makeover with these simple DIY plant pot slipcovers – and turn your potted garden plants into a colourful focal point for your garden, patio or deck! No need to send the plastic garden pots your flowers, herbs and vegetables come in to the landfill and spend time and money replanting them into brand new ones. Use the original pots instead. Simply dress them up in your kids' old clothes (we used leggings and a long-sleeve shirt) and within minutes, you'll brighten your outdoor space like never before. The best part? Changing slipcovers is as easy as changing clothes. Every time the kids outgrow something, you can always dress your plant pot in it next! Here at Lavish & Lime, we're always on the lookout for ideas that allow us to live more gently on this earth. This one we came up with ourselves and it fits the bill to a 'T' – it's a brilliant way to reuse. Below is a short pictogram showing how to make your own plant pot slipcovers – and an eco tip: keep fabric remnants and reuse them as cleaning rags.